Is there truth in (wine) numbers? Everyone knows the expression in vino veritas (in wine there is truth), which (in one form or another) seems to date all the way back to the 6th century BCE. However, in this blog, I spend a lot of time looking at numbers. This immediately raises the oft-asked question of whether "truth" also lies in numbers. In this post I will look at four informative examples where there is truth in some wine numbers, but in each case all is not quite as it seems. Many people are wary of numbers. The issue is that truth lies not in the numbers themselves but in our ability to interpret them. Numbers cannot speak for themselves, and thus they can tell us nothing directly. We have to look at them and work out for ourselves what truth lies therein. We have to be aware of this sort of thing, if we are to make much sense of the world around us; and we all get it wrong more often than we would like. Having so many different languages only makes it much worse, of course. It is the same with numbers, even though there is only one mathematical language. This is why Mark Twain famously referred to "Lies, damned lies, and statistics". The first two emphasize the problems with words, and the third one the problem with numbers. It is easy to fool ourselves when interpreting numbers, and to thereby intentionally or unintentionally mislead others. I mention this because I recently encountered four different examples of misinterpreting numbers in the wine industry, in a way that lead to wrong conclusions, even though the numbers were (almost all) truthful. The first example comes from a book, the second from a blog post, the third from a press release, and the fourth comes from a research paper. Numbers are everywhere! An easy one to start with. This table is from a book about Madeira wine. It discusses the wine production from each of the main grape varieties. Back when I taught experimental design to university students, I used examples just like this one to drill into those students the importance of presenting numbers correctly in tables. Can you spot the error? Any time you see a table where the numbers are supposed to add up to a given total, check whether they do — you might be surprised how often they don't (eg. see the Postscript.) In this case, the Production data for Other European Varieties cannot possibly be right, although the Percentage of total harvest is apparently correct. Working backwards from the Total given, the true Production should be 38,936.05 hL, not 39.04. Note that this is similar to a typographical error, but of a somewhat complex type, and with important consequences. I could not help but be struck by how many wines the tasters rated at 90 points or more on a scale where the maximum is 100. An analysis of the list of 365 wines (excluding the French champagnes - all of which were rated above 90) showed that the average score given to this range was 91.36 and the lowest score given to a wine was 83. Of the 211 reds listed, 83 were rated as 93 points or higher. Now under the 20 point system used in Australian wine shows, 18.5 points is gold medal standard. Multiply by five to get 92.5 and it seems that almost 40 per cent of all the reds (83 out of 211) are gold medal standard, and every red and white wine on their list is well above the minimum 15.5 out of 20 (or 77.5 out of 100) needed to gain a bronze medal. Allowing for the fact that 0 on the 20-point scale equals 50 on the 100-point scale does away with the author's concern about over-inflation of scores, because a Gold medal requires 96 points, not 93 points, and not all of the wines would get a Bronze medal (which requires 89 points not 77.5). However, even this simple correction does not necessarily produce the "correct" conversion from 20 points to 100 points. For example, Australia's Winestate magazine has used a conversion where 15.5 points on the 20-point scale is equivalent to 90 points on the 100-point scale, not 89 points (as shown in the table). This example takes a lot of work to identify the source of the error. In 2015, the climats and terroirs of the wine region of Burgundy were added to the UNESCO World Heritage List. To quote UNESCO: "The climats are precisely delimited vineyard parcels on the slopes of the Côte de Nuits and the Côte de Beaune south of the city of Dijon. They differ from one another due to specific natural conditions (geology and exposure) as well as vine types and have been shaped by human cultivation. Over time they came to be recognized by the wine they produce ... The site is an outstanding example of grape cultivation and wine production developed since the High Middle Ages." The UNESCO documentation suggests that there are 1,247 climats in this World Heritage site. However, Paul Messerschmidt (an amateur wine researcher from the UK) (paulmess[at] gmail.com) noted a discrepancy between this number and the count of those actually listed in the UNESCO documentation. After a lot of (tedious) work, he realized that, while there are 1,247 climat names in Burgundy, there are actually "1,628 separate, distinct, and precisely delimited vineyard parcels in the Côte d'Or". The difference appears to come from searching the database for "climat names" rather than "named climats". For example, "there are vineyards called Les Cras in Chambolle-Musigny, Vougeot, Aloxe-Corton, Pommard, and Meursault (ie. five "named climats"), but they share only one "climat name", as listed in UNESCO's count of 1,247". The difference of 381 vineyards is hardly trivial, especially if you happen to own part of one of them. Paul is apparently now compiling the discrepancies between the UNESCO list and those of The Wines of Burgundy, by Sylvain Pitiot & Jean-Charles Servant, and Inside Burgundy, by Jasper Morris, if anyone wants to help him with his work. Let's return to the subject of scoring wines at a wine show, and awarding medals. This will illustrate a situation where we can easily be mislead when dealing with statistical summaries. One standard way to summarize data like this, and thus to compare the judges, is to calculate the mean score for each judge. In this case, the mean for Judge 3 is 11.8 and for Judge 5 it is 11.3. These two means are almost identical, suggesting that the judges are rather similar, and yet their scores, as shown in their graphs, are quite different. Indeed, Judge 3 seems to have two main groups of scores that are favored, with a score of 12 not commonly being used — and yet this is actually the mean score (11.8)! In this case, the mean does not help us understand the scoring behavior of this judge. This is even more obvious when we look at the data for Judge 1. Once again, there are scores that the judge rarely uses, such as 9 and 10, and yet the mean score is 9.8. When the data have two distinct patterns, we call it "bi-modal", and in such a case the calculation of any sort of average score is going to mislead us badly. The data need to be clustered around the mean, if the mean is going to tell us anything useful. So, remember that truth lies not in the words or numbers, but in our ability to interpret them. Compare this with the situation of a medical doctor diagnosing a disease based on the patient's symptoms. The symptoms really do indicate the disease, and hopefully the doctor extracts the truth most of the time. However, sometimes the doctor is unfamiliar with the disease, and sometimes the doctor misinterprets the symptoms, and sometimes the doctor fails to connect the symptoms with the disease. This is not good for the patient, or the doctor for that matter; but they both need to deal with it. As a final word example, Swedes have an expression for couples living together, which is "samma boende", which they shorten to "sambo" (the first letters of each word). Americans do not introduce their partner as their sambo, but Swedes quite happily do so. This confuses Americans, but not Swedes. How many of you have ever noticed the error in a widely distributed description of the original UC Davis 20-point wine score card (as pointed out to me by Bob Henry)? The description is: "Appearance (2), Color (2), Aroma & Bouquet (4), Volatile Acidity (2), Total Acidity (2), Sugar (1), Body (1), Flavor (1), Astringency (1), and General Quality (2)". The true numbers should be: Flavor = 2, Astringency = 2, so that scores then correctly sum to 20. [I warned you to always check totals!] The written description also refers to a "fairy wine", which would be a very interesting thing, if it existed. 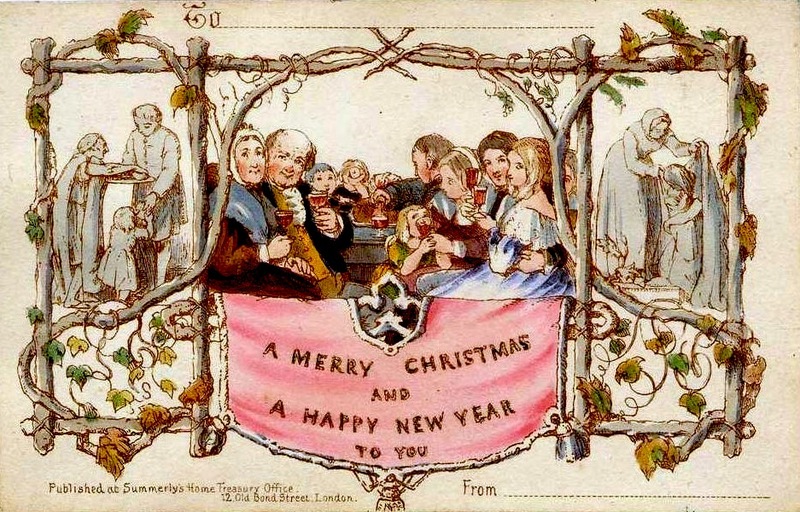 This is a copy of the first known commercially produced Christmas card. John Calcott Horsley, a British painter, designed the card in May 1843, for Henry Cole, a British civil servant and entrepreneur. Apparently, two batches totaling 2,050 cards were printed, and sold later that year for 1 shilling each. There are believed to be about 10-12 of the cards surviving. Rather than the more modern idea of a wintery scene (which has no meaning in December in the southern hemisphere! ), the card apparently depicts three generations of a family, with some of them raising a toast of wine to the card's recipient. The scenes on either side show food and clothing being given to the poor. How much do recent US wine imports differ between years? In a previous post I looked at the volume of wine-brand imports into the USA in 2012 (Yellow Tail — wine imports into the USA do fit a "power law"). It might be of interest to now look at some more recent data, to see how the different brands fare through time. In the following graph I compare the lists of the top-25 imported wine brands in terms of volume sales in the USA, for 2012 (horizontally; the data come from my previous post) and 2016 (vertically; the data come from the AAWE Facebook page). Note that both axes of the graph are logarithmic. There are only 17 wine brands that appear in both top-25 lists (represented by blue diamonds in the graph) — that is, one-third of the wine brands (one-third) were replaced in the top-25 imported volume sellers across the 4 years. Five of the top six wine brands were at the top in both years, as labeled in the graph. These brands have retained consistent sales volumes across the 4 years. Both Yellow Tail and Lindemans come from Australia, while Cavit and Riunite are imported from Italy, and Concha y Toro is from Chile. The big difference in the top grouping is that Principato drops off the list, from 3rd place in 2012 (the pink diamonds represent wine brands that appear in only one of the two lists). This Italian wine brand seems to have greatly decreased its portfolio recently, now down to just three distinct wines. The sales of the remaining 12 wine brands were much less consistent in wine sales, even though they appeared on both lists — that is, the sales volume in 2016 did not necessarily reflect the sales volume in 2012. There were also another seven wine brands that have been replaced from the 2012 list. So, the answer to the title question is: reasonably consistent at the top, but not very consistent elsewhere on the top-25 list. There seems to be a lot of room for maneuvering the volume of brand sales among most of the imported wines. Finally, it is worth looking at the topic covered in my previous post, which is the fit of a Power Law to the data, specifically Zipf's Law, which refers to the "size" of each event relative to it's rank order of size. In the previous post, I noted that data for the volume of imported wine do fit a Power Law very well. That is, when you plot a graph of the logarithm of sales volume (vertically) and the rank order of the wine brands (horizontally), it forms a straight line. This next graph compares the 2012 data (in blue) with the 2016 data (in pink). This graph shows that the Power Law for 2012 was not a fluke, but was repeated in 2016. Indeed, the fit of the data to a Power Law is actually slightly better in 2016 (99% vs. 97%). I think that it is remarkable that so often in our world, complex economic data, like wine sales volumes, which are presumably subject to all sorts of market forces, actually fit very simple mathematical models. This implies that all of the different forces cancel each other out, leaving a simple pattern for us to see and interpret. In this case, for example, we should not expect Yellow Tail wines to sell any better than they already do. I have previously written about Australia's most collected wines. These are the wines that are among the most commonly found in wine-storage facilities, which means that they are suitable for at least short-term cellaring. Another way to investigate the wines most suitable for cellaring is to look at which wines appear most commonly at auctions, on the basis that these wines were originally purchased for storage and later sale (at a profit). This is precisely what Langton's Fine Wine auction house has done, with their Langton’s Classification of Distinguished Australian Wines, currently in its VIIth edition. This lists the most collectable wines, as determined by their auction sales records. Langton's was originally an independent organization, but it is now owned by Australia's larger alcohol retailer (with just over 50% of the market), the Woolworths supermarket chain. The Classification is updated roughly every 4.5 years, with lists produced in 1991, 1996, 2000, 2005, 2010, 2014 and 2018. Langton’s says the classification is compiled by analyzing the track records in the Australian wine auction market over several years — “It’s a combination of the volume of wine sold and prices achieved, balanced against release price. Our number crunchers use this combination of elements to arrive at a number, which is what determines the classification.” This has been likened to the process used for the 1855 classification of Bordeaux wines, but without the politics (see Introducing the fine wines of Australia). The current Classification has three main levels (in increasing order): Excellent, Outstanding and Exceptional. However, the best of the Exceptional wines are distinguished as being Heritage. Previous classifications have used somewhat different names for the groups, and four of them (II-V) had an extra Distinguished level at the bottom. The current classification contains 136 wines — 5 Heritage, 17 Exceptional, 46 Outstanding, and 68 Excellent. The previous classifications mostly had fewer wines — 34 (Classification I), 63 (II), 89 (III), 101 (IV), 123 (V), 139 (VI). Wines have come and gone among the classification lists, with a total of 185 wines having appeared among the seven classifications, although only 21 of them have appeared in all seven of the lists. Most wine producers have only one wine in the Classificxaiton, although some of them do better than this — Grosset, Mount Mary, Vasse Felix, and Wynns Coonawarra Estate (3 each), Henschke (4), Wendouree (5) and Penfolds (10). The latter producer (part of Australia's biggest wine company, Treasury Wine Estates) is probably the best known among the appreciators of fine-wine outside Australia. The Classification contains 116 red wines, 17 white wines, and 3 fortified wines. This extreme bias is the basic limitation of using auctions to classify wines — most people don't cellar white wines and put them up for sale on the auction market; and most Australian fortified wines are ready to be drunk when released, and so there is no point in storing them. We cannot treat this as a quality classification of Australian wine in general. This next table shows the distribution of grape varieties among the wines. As expected, Australia's icon grape type is Shiraz, which makes wines stylistically quite different from the Syrah wines of the rest of the world — fully 40% of the wines are straight Shiraz. These are the Australian wines most beloved of Robert M. Parker, Jr (see The Parker influence). Next, 29% of the wines have Cabernet sauvignon as the dominant component, which generally produces a somewhat less heavyweight wine. Indeed, at least one of the Heritage cabernets has not at all met with Parker's approval (see Sharp differences of opinion over Mount Mary). As for the origin of the wine grapes, 54% of the wines come from the state of South Australia, with Victoria producing another 26%, as shown in the next table. Most wines from South Australia can be considered to be warm-climate wines, while those from Victoria are mostly cool-climate. It is somewhat surprising that Western Australia still produces such a small percentage of the classified wines (11%), given its rapidly rising status over the past decade. It is, however, not surprising that New South Wales has so few wines — when I was young it was considered to be a premium wine-grape state, but it is now over-shadowed by most of the other states. The next table shows the situation when we dig deeper, into the Geographical Indication areas (you can check out their locations in my prior post: Welcome to the wine regions of Australia). The world-renowned Barossa Valley is way out in front, with 19% of the classified wines. Margaret River, the best region in Western Australia, is next (10%), followed closely by Coonawarra, the coolest region in South Australia (9.5%). 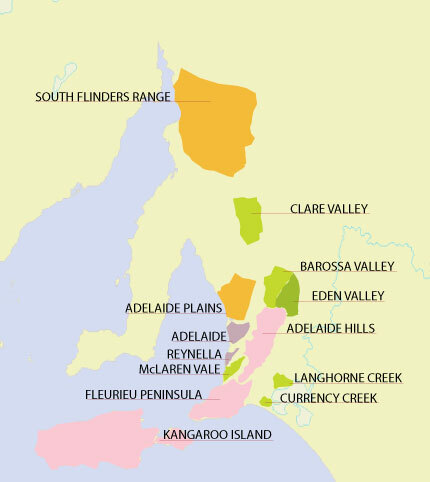 The Clare Valley is surprisingly next (8%), given that it is an often-overlooked region. Finally, it is worth noting that the the last three of the regions listed refer to wines blended across several GIs. This includes 10 of the wines, notably Penfolds Grange, which has always been at the top of the Classification, as Australia's most common auction wine. Worldwide, it is unusual for blended wines to be considered premium — indeed, it has been suggested that "the great contribution of Australia to the world of wine has been lifting the art of blending to a whole new level" (Specific site or blending?). Mind you, Penfolds Grange currently retails for a price that far exceeds its recent auction value (for details, see Penfolds Collection 2018 – An outstanding release… but there’s a twist) — currently, it loses a third of its value during the year immediately after release. This has been going on for at least a decade (see Making, selling, Grange and other wine business). Presumably, we are meant to infer from the relative stability of the wines numbers over the past three classifications that things are becoming settled. However, 16 wines were dropped between Classifications VI and VII, with another 13 being added. Furthermore, 13 of the wines went up at least one level and 15 went down. This means that 42% of the Classification changed in some way between 2014 and 2018. There is nothing unusual about this instability, given what has happened in previous classifications. Of the 185 wines that have appeared among the seven classifications, 21 of them have appeared in all seven of the lists, and 25 of them in six out of the seven; 27 wines have appeared only once, and 34 twice. The Australian fine-wine market is not a stable one, at least as far as auction sales are concerned. So, it has been pointed out that the Classification portrays an evolving winemaking culture in Australia. However, few people seem to have looked at this evolution (eg. A look at Langton's Classification from 1991 to 2005). I may do this at some time in the future; but for now I will simply look at which wines have been most consistently present in the Langton's Classification. 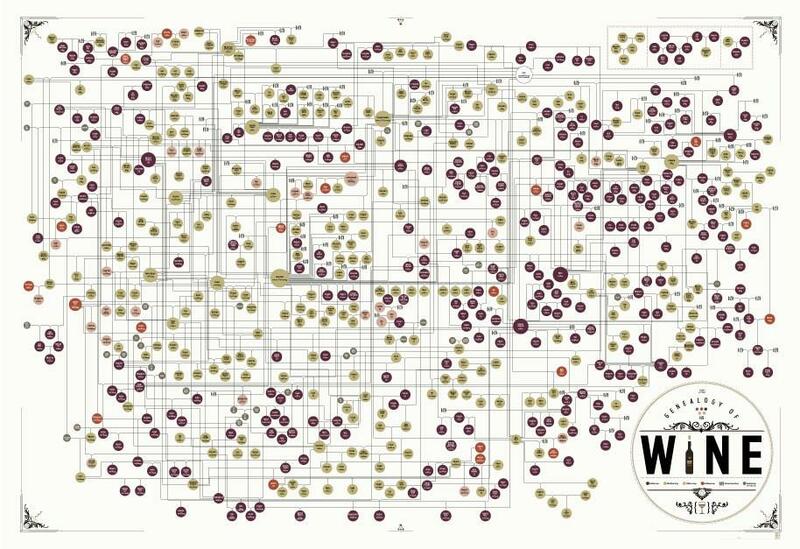 The 18 wines at the top-right of the network are those that have always been classified highly — presumably, these are the cream of the crop. Those wines at the top-left moved to the top of the list in Classifications IV or V, while those at the bottom-left moved to top in Classification VI. Those wines at the bottom-middle made it to the top only in the current classification (VII). Neither the Langton's list of wines nor the Wine Ark list (as discussed in the previous post on cellaring wines) can be considered to represent all of Australia's finest wines. Indeed, I noted last time that there are notable differences between the two lists (and they also differ from the results of both wine shows and critic reviews — see How to find consensus on the top drops for your cellar). Both lists refer solely to wines preferred for long-term storage, and therefore white wines and sparkling are severely under-represented (there have only ever been two of the latter on the list) — people buy most white and sparkling wines to drink soon, not to store (or sell). Indeed, the best sparkling wines are often not released until they are ready for drinking (most of these are from Tasmania), and neither are the fortified wines (mostly from northern Victoria, and South Australia). Cult wines are also excluded, because they are not made in enough volume to affect the auction market, or to occupy much space in cellar-storage facilities. Quite a number of such wineries survived the cult-wine boom of the 1990s (see InvestDrinks), including the wines of Clarendon Hills, Fox Creek, Greenock Creek, Noon Winery, Three Rivers (aka Chris Ringland), and Wild Duck Creek Estate. The main cult winery in the Langton's list is Wendouree (with all five of its wines!). 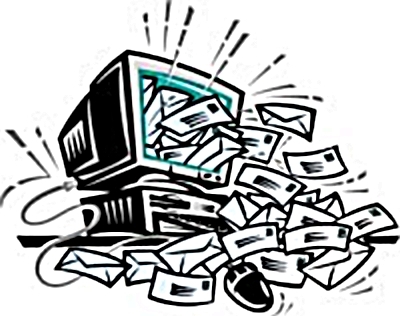 Anyone who takes their wine seriously is likely to be inundated with email "blasts" from all and sundry. 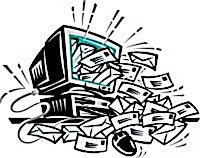 Moreover, if you have ever registered with a wine store or distributor, then you will be getting emails daily, weekly or monthly, extolling the virtues of the current crop of wines, and telling you just how advantageous are the current prices. These emails may even contain more than a grain of truth. In support of that truth, wine sellers often use the opinions of well-known people and publications, at least when those opinions are supportive. Indeed, the more supportive they are, the more likely they are to be quoted. So, an email inbox full of these offerings does, in my mind anyway, raise the question of just how often particular people / publications get cited. Moreover, I have wondered whether the USA and Europe quote the same people to the same extent. To answer these questions, I have used two sources of information. The data for the USA come from Bob Henry (a business school-educated, ad agency-trained wine marketer based in Los Angeles), who has long used Gmail to archive email-blast offerings from many of the leading US wine merchants (they are listed at the bottom of this post). I searched through the 14,403 emails from late 2006 to April 2017. The data for Europe are my own, which I collected from April 2017 to March 2018, totaling 1,728 emails. These came from merchants in Germany, Italy, Spain, Sweden, and the United Kingdom (they are also listed at the bottom of this post). The Wine Spectator has had around 350,000 paid subscribers, while the Wine Advocate has had 40-50,000. In both cases these are likely to be predominately US residents. Mind you, the subscription penetration rate of habitual US wine drinkers is likely to be <1%. However, in the matter of marketing wines this is what the retailers have, and the Advocate is usually noted to out-perform the Spectator, in terms of quotability. However, this is only true in the USA. In Europe, the Spectator, the UK-published Decanter, and the Austrian Falstaff magazine appear to do better. For individuals, Robert M. Parker Jr has been the world's wine guru for several decades, although his influence may now be on the wane. Perhaps he has been under-performing, since he only made it into 48% of the US emails? After all, he made it into 64% of the European emails! However, note that the US wine stores may mention either Parker or the Advocate (his former newsletter), whereas the European stores focus almost solely on the man himself, when quoting wine opinions. Indeed, other than Parker, the European emails do not cite many critics at all. This is in marked contrast to the US emails, where at least three other people get quoted 5-10% of the time. This may have something to do with the fact that most of the critics are based in the USA, even if they do comment on wines worldwide. The profession (or sport) of quotable wine criticism was developed in the USA — in Europe, there are far fewer critics whose commentary is worded in a manner likely to help sell a lot of wine. Indeed, the most quotable information is usually a quality score, and many of the European critics eschew the art (or sport) of scoring wines. For example, Jancis Robinson may well be "better known than Robert Parker Jnr, at least outside the US", but her wine notes (and lack of scores) are not the stuff that advertising copywriters dream of. This, perhaps, is the situation in Europe — there is no reason why the local critics should be helping to advertise wine, as opposed to helping consumers identify desirable wines. So, the critics are not providing quotability. The US critics, on the other hand, are very much doing so, and are thereby being cited more prominently in their homeland. Parker and his Wine Advocate have provided the archetypal selling points (ie. quality scores), along with the Wine Spectator. It will be interesting to see what happens under the new regime at the Advocate. You may also ask yourself why sites like CellarTracker are not quoted. 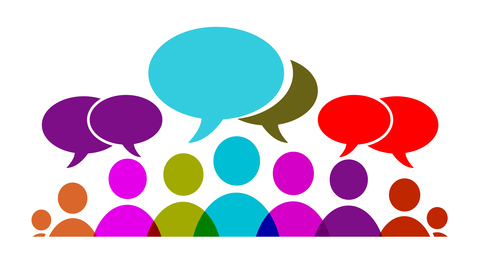 After all, approval by a community site should, in theory, encourage other consumers. Perhaps it has a lot to do with the fact that the scores are averaged across a number wine drinkers, and are therefore lower than those of individual critics (a score of 89 will not sell a wine but 90 will). More importantly, perhaps, the scores do not accumulate until after the retailers have started selling the wines (post hoc scores will not sell wines but a priori ones will). This suggests that the critics will continue to wield power, at least in the world of wine marketing. The emails came principally (but not solely) from the following stores. We are all familiar with the concept of a family tree (formally called a pedigree). People have been compiling them for at least a thousand years, as the first known illustration is from c.1000 CE (see my blog post on The first royal pedigree). However, these are not really tree-like, in spite of their name, unless we exclude most of the ancestors from the diagram. After all, family histories consist of males and females inter-breeding in a network of relationships, and this cannot be represented as a simple tree-like diagram without leaving most of the people out. I have written blog posts about quite a few famous people who have really quite complex and non-tree-like family histories (including Cleopatra, Tutankhamun, Charles II of Spain, Charles Darwin, Henri Toulouse-Lautrec, and Albert Einstein). Clearly, the history of domesticated organisms is even more complex than that of humans. After all, in most cases we have gone to a great deal of trouble to make these histories complex, by deliberately cross-breeding current varieties (of plants) and breeds (of animals) to make new ones. For plants, we have also propagated genetic variants, thus making an even more complicated history (see my post Grape clones and varieties are not always what they seem). In most cases, we have no recorded history for domesticated organisms, because most of the breeding and propagating was undocumented. So, the idea of reconstructing these histories is very different from the popular pastime of doing a bit of "family history research". Indeed, until recently it was effectively impossible. This has changed with modern access to genetic information; and there is now quite a cottage industry within biology, trying to work out how we got our current varieties of cats, dogs, cows and horses, as well as wheat, rye and grapes, etc. There are a number of places around the web where you can see heavily edited summaries of what is currently known about the grape pedigree. However, these simplifications defeat the purpose of this blog post, which is to emphasize the historical complexity. 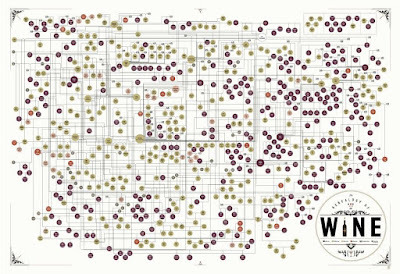 The only diagram that I know of that shows you the full network is one provided by Pop Chart (The Genealogy of Wine), a group that provides infographic posters for just about anything. They will sell you a full-sized poster of the pedigree (3' by 2'), but here I have provided a simple overview (which you can click on to see somewhat larger). You can actually zoom in on the diagram on the Pop Chart web page to see all of the details. This allows you to spend a few happy hours finding your favorite varieties, and to see how they are related. Perhaps the most interesting thing to note is just how many modern varieties have what the French call Gouais Blanc as one of the parents. This white variety is actually an indigenous Croatian variety known there as Štajerska Belina. Try to remember this the next time you drink a glass of Chardonnay or Gamay, both of which are crosses between this variety and Pinot Noir. Why are there so many missing bits? Reconstructing grape genealogies is often a tricky business, even with genetic data. Originally, this was done using morphological characters (the study of grape morphology is called ampelography), along with whatever historical records exist. However, these days we use DNA from whatever varieties and cultivars are available for sampling (see my post Grape clones and varieties are not always what they seem). 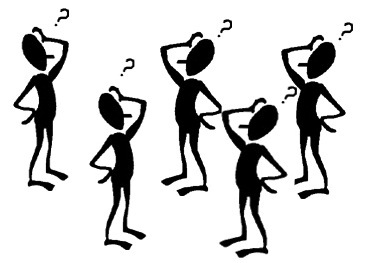 Perhaps the biggest problem is that many of the cultivars are no longer known (there have been at least 10,000 of them recorded at some time in history), so that the pedigree is full of question marks representing unknown (unsampled) parents. This has an odd practical consequence, which is that the time direction of the pedigree will be ambiguous whenever there is a missing parent. That is, we cannot work how which is the parent and which is the offspring among closely related varieties. Technically: estimates of what geneticists call identity-by-descent (IBD) are calculated based on the technique of linkage analysis for all pairwise comparisons of samples. However, complex inter-breeding schemes can generate IBD values such that we cannot distinguish parent-offspring relationships from sibling (brother-sister) relationships. There are many examples of this problem in the study of the grape genealogy. As but one example, there is an online page associated with the book Wine Grapes (by Jancis Robinson, Julia Harding and José Vouillamoz). One of the web pages shows some of the pedigree diagrams from the book, and on this page there are three possible pedigrees for Syrah. The current genetic data cannot distinguish between these three possibilities (shown here). This web page also happens to illustrate another aspect of drawing complex pedigrees. Sometimes, in order to avoid drawing intricate networks, and to make the diagram look more like a "family tree", authors resort to a standard subterfuge. The strategy is to show varieties multiple times in the diagram, to avoid drawing reticulate relationships (see my post on Reducing networks to trees, where I illustrate this using the pedigree of Zeus). This situation occurs in the pedigree for Pinot Noir (the authors note: "For the sake of clarity, Trebbiano Toscano and Folle Blanche appear twice in the diagram"). The International Organisation of Vine and Wine (OIV) has recently indicated that the 2018-vintage global wine production is "back to normal" in size (Global wine harvest bounces back). However, a year ago the OIV reported that the 2017 global wine production had fallen to its lowest level since the beginning of the 1960s. This decrease was the result of the inclement weather that extensively damaged vineyards in the world’s largest production area, western Europe (containing the world's three biggest producers: Italy, France and Spain). As always, I wanted a picture of what it looks like to have "the lowest production for 60 years". Is this decrease only a little bit lower than the past few decades or a lot lower? A graph would obviously answer this for me. However, finding this graph turned out to be much more difficult that I thought. I expected that somewhere there would be a graph of annual global wine production, stretching back for decades, but I turned out to be badly wrong. The trusty Statistical Compendium presents the production data averaged across each decade, only (this was graphed on the AAWE Facebook page after I started writing this post); and the OIV online data go back only to 1995. At least the FAO online data go back to 1961, although it is measured in tonnes of grape must not liters of wine. Eventually, Kym Anderson (of the University of Adelaide) kindly pointed out to me that the spreadsheet associated with the Statistical Compendium does actually have the annual data, all the way back to 1860. So, here is the graph that I have been looking for, with global wine production shown vertically (a hectoliter is 100 liters — for comparison, a dozen standard bottles of wine is 9 liters), and time proceeding horizontally. The pink line shows the 2017 production level compared to recent decades. Obviously, there was a slow increase in production until World War II, with a big dip in production during the war itself. In contrast, there was a dip for only one year during World War I, although that year (1915) had the lowest production after 1863. After the second war, there was a rapid increase in production until 1980, followed by a decline until 1990. Production has remained steady since then. As far as the 2017 production is concerned, all production levels prior to 1962 were lower (ie. 55 years earlier). However, both 1991 and 2002 came close to the 2017 level. This result differs somewhat from the OIV reports, which originally agreed with this but then changed their previous low year to 1957 (eg. World wine output falls to 60-year low). However, the OIV values are an average of 5 million hectoliters greater than the values shown here. This graph leads to the obvious question about wine consumption. After all, we have been told for several decades about a so-called "wine lake" caused by world-wide over-production. Indeed, in the past the EU paid to have excess wine converted to spirits, and more recently it has been paying grape-growers to pull up vines, especially in southern France. The government of South Australia tried the same vine-pull tactic back in the late 1980s. Here is the graph that compares consumption with production, as recorded in the Statistical Compendium spreadsheet. This shows that consumption kept close pace with production until 1963, although the relevant consumption is usually the year (or two) after production (since the wines do not appear on the shelves until then). After 1963, production has almost always exceeded consumption. This is the origin of the wine lake — indeed, in some years production far exceeded consumption. Both consumption and production dipped towards the end of last century, which is when the various governments started to address over-production. Since then, consumption has slowly increased again, although production has continued to exceed consumption. However, the two levels were very close in both 2012 and 2017. Supply and demand caused concern in 2013, when it was reported by Morgan Stanley that "an excess of 600 million unit cases (almost one quarter of global consumption) in 2004, [was] reduced to just 1 million unit cases in 2012." At that time, it was suggested that "there's little indication that world production can keep pace with the oenophilic hordes." The production levels of 2013–2016 eased this situation. However, the low production in 2017 has once again led to reports of a sharp decline in French wine inventories. A few weeks ago, I noted that the wine-making regions of Australia are rather poorly known, except perhaps in Australia (How aware are wine drinkers of wine regions?). This blog post is an attempt to at least partially redress this limitation. Let's start with the geography. I showed a map in an earlier post illustrating that Australia is the same size as the continental USA, and much larger than western Europe (The rise, rise, fall and rise of Australian wine). However, the wine-making regions are restricted to a rather small part of the continent, mainly the south-east but also part of the south-west, as shown in the map above. The reason for this is explained in another post (Growing degree-days maps of Australia and the western USA). For most of Australia, the heat summation is way too high — this is the sum of the daily temperatures above 10 °C (50 °F) during the grapes' growing season. Only around the southern coast is the summation suitable for grape vines (see the map further down this post), although in the high-altitude south-eastern part the vines are absent because the heat summation is too low. Most of the suitable vine-land area of Australia already has formally named Geographic Indication (GI) viticultural areas. Most of these are shown in the next map — you will need to click on it to see the details. There is also the largest recognized region of all: South-Eastern Australia, which takes in the whole of New South Wales, Victoria and Tasmania, plus those regions of Queensland and South Australia in which grapes are grown (see the next map) — this includes everything except the vineyards in Western Australia. This is the most likely region to appear on labels for bulk Australian wine, which indicates that the grapes come from several of the large inland-irrigated grape-growing areas. However, it can also mean that the wines are blends from more than one of the smaller named regions. If you want to peruse more detailed maps of the GI areas, then they are available on the Wine Australia web site (the map links are near the bottom of that page). 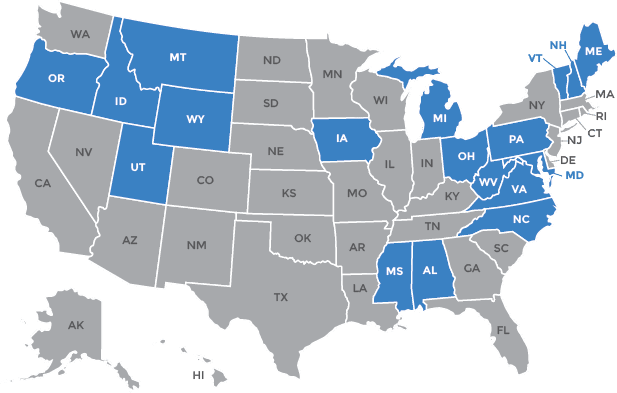 What types of regions are they? Note that, at the moment, the state of Tasmania is a single GI zone. This is Australia's coolest region, and the focus of a burgeoning sparkling-wine industry. There are seven quite different grape-growing areas within the state (see Regionality: the future of Australian sparkling), and it is thus quite likely that it will soon be sub-divided. Australia has areas within all of the Winkler Index zones, based on heat summation, from Cool (I) through to Hot (V). Therefore, all wine types can be produced in at least one of the areas, and usually in several of them. The GI regions are shown in red on the map below, which also color-codes the five Winkler Index zones from blue (coolest) to orange (warmest). The best-known region internationally seems to be the Barossa Valley, which makes warm-climate Shiraz wines that are very unlike the Syrah wines of the rest of the world. However, this fame seems to date mainly from the discovery by Robert Parker, in the 1990s, that these wines suit his palate particularly (within Australia, the move to prominence started in the mid-1980s). While the uniquely Australian Shiraz and Shiraz-Cabernet blends have taken the limelight, many of the wines actually have Mataro (Mourvèdre, Monastrell) also present, which has been referred to as "the secret ingredient of the Barossa reds", whether it is mentioned on the label or not (see A dark horse with exceptional pedigree). By way of historical contrast, back in 1974 the wine merchant Dan Murphy published Classification of Australian Wine, in which book he noted: "Although no wine authority has ever written off the Barossa Valley as a top quality area, I cannot remember any one of them giving it a special accolade as a constant producer of world class table wines." Thirty years later, the wine writer James Halliday, in the Wine Press Club of NSW Annual Lecture for 2005, pointed out that the wines of the Barossa Valley usually don't win Australian wine-show trophies, either. The Barossa is actually part of a larger collection of GIs that follow a range of hills (the Mount Lofty Ranges) that run north-south through the state of South Australia (see the next map). This is sometimes treated as the epicenter of Australia's international wine reputation, at least for those who like Parker-style wines. 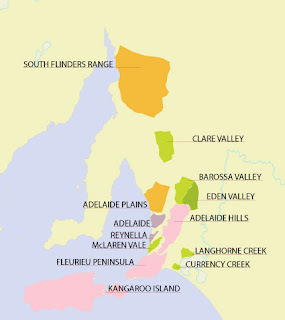 The various regions included are described in The 13 Wine Regions of the Adelaidean – Mount Lofty Ranges. In spite of the reputation of this region for foreigners, the Australian focus in the past couple of decades has been on the development of cool-climate wine regions, especially for white wines. Most of these regions are in the states of Victoria and New South Wales (see the Winkler map above), and especially the emerging region of Tasmania. These areas produce wines that are rarely to the taste of Robert M. Parker Jr (for example, see the 2005 kerfuffle over the cool-climate Mount Mary Quintets wine — Sharp differences of opinion over Mount Mary; and The differences of opinion continue: Mount Mary Quintets vs. Robert M. Parker Jr. part 2). Another important point to note is that some of the traditional wine companies produce multi-regional blends made to a particular style, rather than having a terroir-driven set of wines. The classic example is Penfolds, the premier brand of Treasury Wine Estates. Of their top 10 wines, 7 are multi-regional blends (and thus list "South Australia" or "South-Eastern Australia" as their geographical indication). These style-driven wines are not necessarily to everyone's taste, of course; and many people (including myself) suspect that they are aimed at the wine-investment market rather than the wine-drinking market. For further reading, there is one book specifically describing the wine-making regions of Australia, but this now more than 15 years old, having been first published in 1999 and then updated in 2002. This is John Beeston's The Wine Regions of Australia. Alternatively, there is the slightly more general Wine Atlas of Australia, by James Halliday, with editions in 1992, 1998, 2006 and 2014. It is also worth noting that, in order to understand the nature of the regions in as much detail as possible, it was recently announced that: "The vineyards in Australia’s 65 wine regions will be accurately mapped for the first time using high-resolution satellite images and advanced machine learning, in a national census of Australia’s wine-grape area" (AI to map Australia’s 65 wine regions row-by-row). This would be a first in the New World, to compete with the detailed maps of the wine-making regions of Europe. Tourists in wine regions are a big deal in Australia. Marlene Pratt has an interesting description of the various types of wine tourists in Australia (wine lover 15%, wine interested 55%, wine curious 17%, plus 12% along for the ride). When I was young, you could simply arrive at almost any winery during business hours and someone would look after you. However, these days about one-third of wineries charge a small fee, which will be deducted from any purchase you make. Earlier this year, Wine Australia conducted a cellar-door and direct-to-consumer survey, which showed that cellar doors are the driving force behind direct-to-consumer sales in Australia, accounting for 44 % of direct-to-consumer revenue, ahead of wine clubs and mail orders (Wine Australia release full survey findings on Cellar Door direct wine sale opportunities). As for which regions are the most popular to visit, The Wine Front web site conducted an online poll from March 2017 until now, asking: "What’s the best Australian wine region to tour (ie. from a pure wine touring perspective)?" The next graph shows you how the 476 voters responded. This list is not necessarily based on the quality of the wines, since wine tourism and wine quality are not always closely related. To check this, we could compare this list to one for the number of classified wines in Langton's Classification of Australian Wine, which is based on the prices of the wines at auction. This is shown in the next graph. Margaret River for my money is now the most exciting wine region in Australia, both for the wine tourist and the fine wine buyer. The beaches and ocean scenery, the wealth of winery restaurants, cheese and boutique breweries, plus excellent scenery, makes it unbeatable. My home town of Tanunda in the Barossa Valley looks very dreary indeed, as does the Barossa as a tourist destination. Lonely Planet has very recently released a tourist guide called Wine Trails: Australia & New Zealand, covering 30 of the wine regions (plus 10 from New Zealand). Dan Murphy, in the book quoted above, also referred to: "the world of Europe and the Americas, the inhabitants of which, oddly as it may appear, seem to think that the vineyards of Australia are far more distant from them than we think the Americans are from us." So, if you ever happen to be in Australia, you should certainly check out some of these regions. In the meantime, you could do a lot worse than try some of their wines, instead. 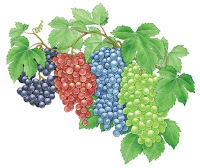 I recently noted that the twin ideas of "varieties" and "clones" are basic to grape-growing, whether they are used for wine-making, table grapes, raisins, juice, jelly, canning, or rootstocks (Grape clones and varieties are not always what they seem). This leads me to ask the question posed in the title. The number of clones is often related to the genetic mutation rate of the variety. Pinot noir is therefore recognized as one of the most mutable grape varieties. Indeed, it is so mutable that we have produced several different clones that we actually treat as being varieties, because they can be used to make very different wines (as discussed in the previous post). Indeed, Pinot noir itself also has more recognized clones than do most other varieties. This is illustrated in the first graph. The data come from the list of varieties and clones currently approved for viticulture in France (Catalogue of vines grown in France). Each grape variety is listed horizontally, with the number of approved clones counted vertically. Only the 38 varieties with at least seven clones are shown — there are a total of 269 approved varieties, and 950 clones, although 161 of the varieties (60%) have only one listed clone. As you can see, Pinot noir is way out in front. Its history is, of course, associated specifically with Burgundy, although it is now an international variety. It is therefore interesting to note that the second variety in the graph is Gamay, the red-wine grape from Burgundy's nearest neighbor, Beaujolais. The people of this part of France have had a long time to keep an eye out for potentially useful mutants among their vines. We can, of course, separate the graph into both red- and white-wine grapes, and this is illustrated in the next graph, which shows the 30 varieties of each type with the most clones. It is immediately obvious that red-wine varieties tend to have more clones than do white-wine varieties. Presumably, this reflects the historically greater interest that has generally been shown in producing "fine" red wines compared to white wines. As usual in this blog, we can search for simple patterns among these data. Mathematically, the data from the first graph most closely fits a Power model, as shown in the following graph, where the added line shows the model. The most obvious place the model does not fit the data is the first two varieties — both Pinot noir and Gamay actually have fewer clones than "expected" from the model! If we fit the Power model to the red and white varieties separately, as shown in the next graph, then it is interesting to note that the model fits the white varieties very well, although the first white-wine grape (Chasselas) has too few clones. However, the model fits the red-wine varieties rather more poorly, and especially Pinot noir and Gamay have many too few clones for this model . The latter results from the greater number of clones for the remaining red varieties — red-wine grapes generally have more clones than we would "expect" from a simple mathematical model. So, we may conclude that white grape varieties have clone numbers that fit a simple mathematical model, but red varieties have more clones than can be "explained" by any such model. This is likely to be because red wines have been preferred by consumers, so that the vignerons have been more keen to find "better" clones for lots of the red varieties but only a few of the white varieties. Lest anyone thinks that there is some restriction on the number of grape varieties that can be used in France, it is important to note that new varieties are being approved all the time (eg. for 2018: New grape varieties in France, some forgotten, some hybrids). The matter of hybrids is of particular interest, because they have long been detested in France but are now being seriously considered as a solution to viticultural problems like downy mildew (see French wine's hybrid dilemma). Grapevine clonal material in France is subjected to extensive testing and certification under the aegis of the Ministry of Agriculture. The Institut Français de la Vigne et du Vin (IFV) is a national agency certified to manage and coordinate the French national clonal selection program. The responsibilities now entrusted to the IFV were formerly performed by an entity known as the Etablissement National Technique pour l’Amelioration de la Viticulture (ENTAV), and include maintenance of the French national repository of accredited clones, and administration of the ENTAV-INRA authorized clone trademark to protect the official French clones internationally. The list of approved French cultivars is important, because only cultivars from this list can be used in wines given legal protection under the Appellation d'Origine Contrôlée (AOC) scheme administered by the Institut National de l'Origine et de la Qualité (previously INAO). Recently, INAO has allowed other varieties from the list to be used in AOC wines as "grape varieties for climate and environmental adaptation", which means that issues such as climate change can be addressed by trialling new varieties. There has been some concern expressed about restricted use of clones in many vineyards, especially outside Europe (eg. Genetic instability and how it affects wine). In the past, vineyards tended to be a mosaic of clones, but modern agriculture (not just for grapevines) has shown a strong move towards using single clones — those that are seen as being "the best" in some ineffable way. For example, Cabernet sauvignon clones 07 and 08 have been the basis of many of the California Cabernet vineyards for decades (see The guide to wine grape clones). Vegetative propagation [has] discouraged the generation of unique cultivars through crosses. The grape currently faces severe pathogen pressures, and the long-term sustainability of the grape and wine industries will rely on the exploitation of the grape’s tremendous natural genetic diversity. To this end, of the known varieties, 7,200 are grown at the Centre de Ressources Biologiques de la Vigne (CRB-Vigne) de Vassal-Montpellier, near the town of Marseillan in southern France. Also, there is the matter of intellectual property rights — the use of some clones requires the payment of royalties (see How wine clones are already taking over). The Foundation Plant Services Grape Registry currently lists 594 grape varieties used for all purposes in the USA, which is more than in France, but many of these are proprietary. The latter do include, of course, the ENTAV-INRA authorized clones.